Yerba Buena Center for the Arts gave us a stack of 60 DVDs and a short list of the “3 Big Ideas” for their campaign to market their new season. We designed a detailed outline on a large marker board and pitched it to the client. The marker board facilitated a group discussion to refine the design and we got the green light to produce the video. 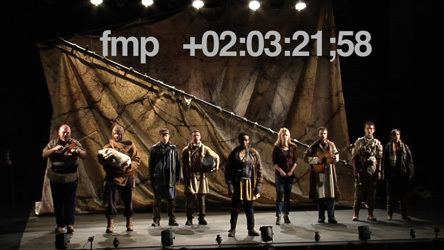 For the American Conservatory Theatre, we produced a behind the scenes video for their World Premiere production of a new translation of Bertolt Brecht’s Caucasian Chalk Circle. We used a DVD with visible time code (a “Window Dub”) and 3×5 cards to develop the story. Can be rearranged far more rapidly than an outline on a computer or scribbles on a marker board. Force us to think in clear, specific, “beats” that drive an engaging story. Demand that we write in concise, clear, unique concepts. Ideas which are repetitive or vague become immediately apparent when written on a card. Create a helpful, abstract, distance between the raw video and the story. Are particularly useful when we work from lengthy interviews or video documentation of a performance and need to “discover” the story hidden inside a large volume of material. The client used the Window Dub to select moments that best communicated their message and gave us a “Paper Edit” — a simple spreadsheet with time code in and out points for each selected video clip. We worked with the client, arranging the 3×5 cards to create the story and then matched that sequence in our editing system with the real clips. We worked back and forth, alternating between editing the cards and editing the video clips on the computer until we were satisfied. When our clients are remote (which can mean in a different time zone or just across the traffic-clogged Bay Bridge) then video chat with Skype or iChat may be the best way to go. Almost all of our story conferences with Deke McClelland for our video podcast series dekePod were held over Skype. Video conferencing is free and green. We live by the mantra, “shorter is almost always better” and often remind ourselves that automobiles, which are highly complex machines, are sold in thirty-second advertisements. Many clients regularly overestimate the time required to visually communicate their message and we are delighted to prove to them that faster and shorter are both more economical and more effective. We read scripts out loud and time them with a stopwatch. Having a computer read a script out loud is a great way to check for redundant words, thoughts, or lack of logic. And it’s fun! “Alex”, “Bruce”, “Kathy” and “Vicki” are just some of the synthetic voices we can assign separately to each role in a script. “Cold reading” a script (reading without rehearsal) is a very specific acting skill and the computer voices on our Apple workstations can cold read better than some of the actors we know. Auditions and screen tests are not just ways to hire an actor. Auditions are an essential way to check the chemistry between actors before casting them. Sometimes an individual actor might be perfect for a role, but not be right in the context of the assembled cast. We also learn about the script as we hear it read and direct the performance. We often revise scripts as we hear them read out loud. This is why we always personally thank actors, even if we do not hire them. It is amazing how much you can learn about a video script in a live reading. We use props, music, and the imagination of a live audience to create some of the experience of the finished film. We carefully guide the audience feedback so we get answers to specific questions and, most importantly, to hear where they were engaged in the story, disinterested or bored, or confused. Afterward, we adjust the script in response to feedback, if appropriate. If a script is not engaging when read to an audience, it is unlikely to capture their interest as a finished film. Beta Testing: Does the Message Work? Beta testing means shooting a test version of the video. This may mean shooting the video rapidly, with minimal technology and only stopping for the worst mistakes. If a script is not engaging with low production values, why would it be better after you spend money on flashy production values? Our Beta tests are then circulated among a selection of the target audience and we adjust the script according to their feedback. We have developed entire hour-long training videos this way resulting in great success. Beta testing can also be used to document an existing “performance” (like an expert trainer presenting their knowledge to the camera). The document can then be transcribed and used as the foundation for a written script. Beta testing allows us to focus the script on key concepts, remove unnecessary material, prove audience comprehension, and adjust all the elements of the product before committing to a full production. Finally, clients beta test videos to bring all the stakeholders on board at the earliest stages of a project. We use storyboarding and animatics to create a very rough test of the visual elements of a video before we have shot a single frame. Storyboards are drawings or photographs of the action specified in the script. An animatic is like a slide show with a soundtrack; we place storyboards, dialogue sound and music on a video timeline and make a crude movie. To develop the aesthetic elements of a production, we collect visual references that help us create a common visual vocabulary with the client and learn what works for them, for us, and serves their message. Visual reference might be images from the client’s past or current marketing campaigns and photos torn from a magazine or found on the Internet. Of course, film and video clips are also extremely useful in collaborating with the client and develop a style for the project. We also collect references to assist us in defining the type of script to develop for the project. There are an infinite number of styles of presentation, from a “documentary” type video to serious drama, humorous spoof to straight ahead training. Our development goal is to define a style that meets both the client’s communication needs and their budget. There are multiple paths to develop a video from initial concept and need to final design and we are always open to discovering new tools for script development. We have listed a handful of tools that we find useful. Which one we use, depends on the needs of the project, the budget, and the experience and understanding of the client. When a client contacts us with a potential project, one of our first tasks is to define a development workflow that works for the specific production. For clients who engage us deeply in the development process (as opposed to treating video as a commodity and prematurely asking “how much does it cost?”), we deliver the very best results at the most economical price. See the Yerba Buena Center of the Arts Season Preview here. See the Behind the Scenes of The Caucasian Chalk Circle here.